The Mighty MJD took the following picture at Radio Row in Phoenix. Maybe the Tampa Bay Rays new what they were doing when they decided for an image overhaul. 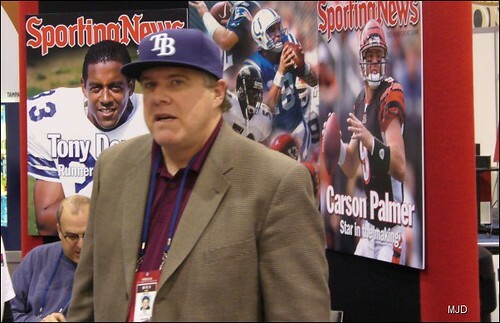 Let us get this straight…The Yankees get LeBron James, the Red Sox get Jennifer Garner, and the Rays get Peter King? Actually…sounds about right. Does this count as an SI jinx? Farve and Romo will be jealous. Good God I hope Peter has tuberculosis. You mean beer chugging, popcorn munching, oatmeal loving, fried chicken eating, coffee drinking, SI Sports Collumnist Peter King?